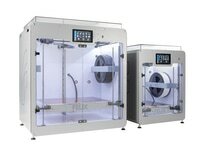 The new Tec 4 build platform is designed to provide the best 3D printing surface for your FELIX. provide optimal use of the available space and use as less material as possible. The lightweight aluminium sandwich plate includes a strong heater which is capable of heating the surface up to 90 degrees celsius. Many years of experience and developing lead to a slim and steady print platform, providing optimal use of the available space and use as less material as possible. The lightweight aluminium plate is cleverly designed in many ways: the eye-catching layout of the platform is designed to reduce unused space and to keep the construction as light as possible. The platform contains a heater element which can heat the platform up to 90C, making it possible to print with challenging materials. NOTE: Kapton sticker is NOT standard included. The two large dial buttons mounted on top of the build plate allow for easy and precise calibration, which is essential for high quality 3D printing. The Tec 4 build plate requires the Flex Plate to print on. 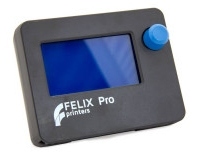 The Flex plate is a flexible plate which allows for easy removal of the printed object. Sometimes prints can be very well connected to the build surface, bending the Flex plate will release the print without using a lot of force. Magnets integrated into the Tec 4 build platform will make sure the Flex plate will always stay in place during printing. Aluminium Sandwich Plate including heater.